Vintage posters have a long history and they existed before the advance technology of photo editing applications. Vintage posters were first started in the late 19th century and they were utilized for the advertisement purposes. Back then, due to the unavailability of today’s luxurious printing techniques, these vintage posters were used to be printed in black and white only. You may also see Poster Templates. These vintage examples will help to you to design an inspirational and motivational poster. They are extremely exquisite and subtle. 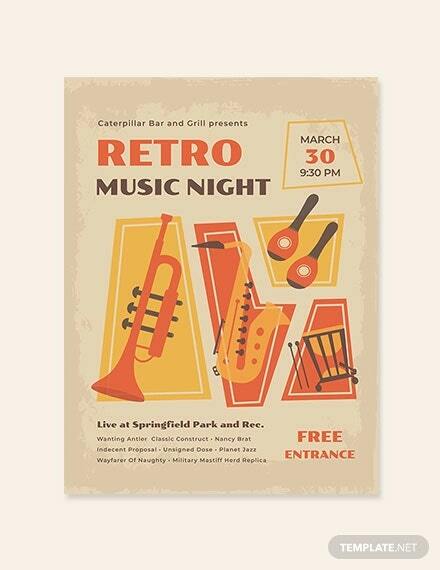 These examples will enable you with more exposure to design a wonderful vintage poster. You will also experience a lot of diversity. 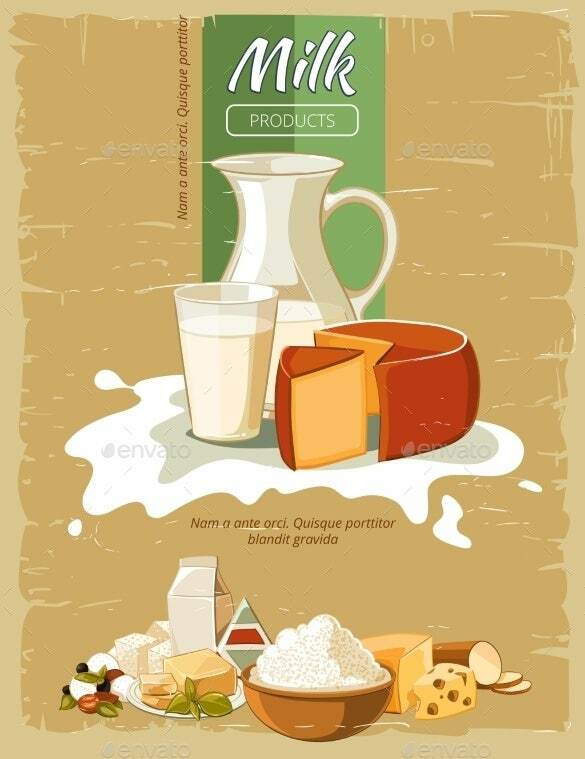 Milk Products Vintage Poster Template is for illustrating breakfast details such as nutrition, organic natural fresh cheese and any such milk products. The graphic files come with Vector EPS, JPG images etc. You need to have minimum Adobe CS version to use this template. 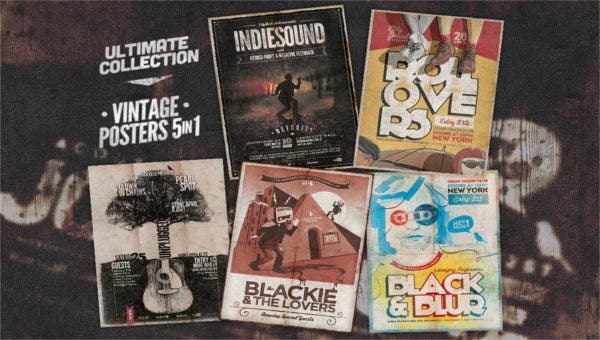 Alternative Events Vintage Poster boost musical events like rock gigs, acoustic gigs, blues, indie, club gigs, folk and similar alternative events. It comes with options to choose from four colours, 2 PSD files with sizes of A4 or 8.3×11.7inch and print ready CMYK and 300dpi. 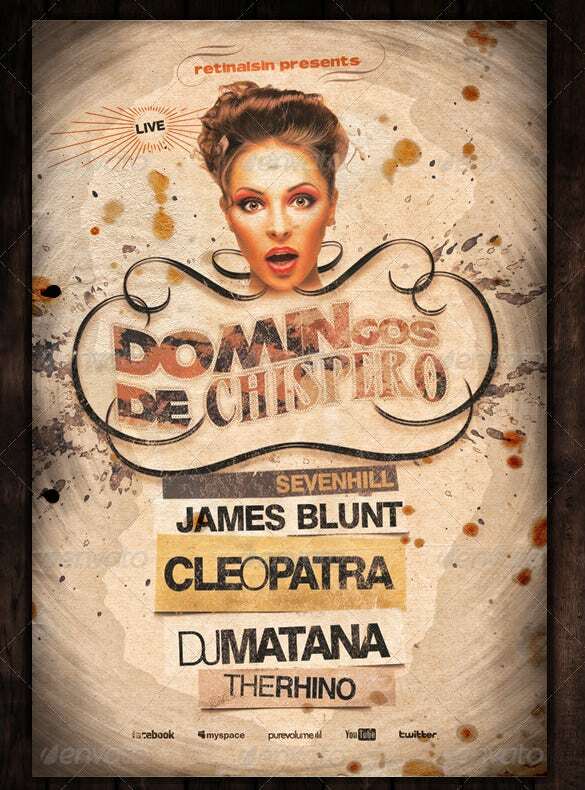 Chispero Vintage Poster PSD Format is the quickest way to create a flyer as per your requirements by uploading your own images and photos and any illustrations and attract more customers. It comes with CMYK, 300dpi, and options to select various colours and graphics of Vector formats. 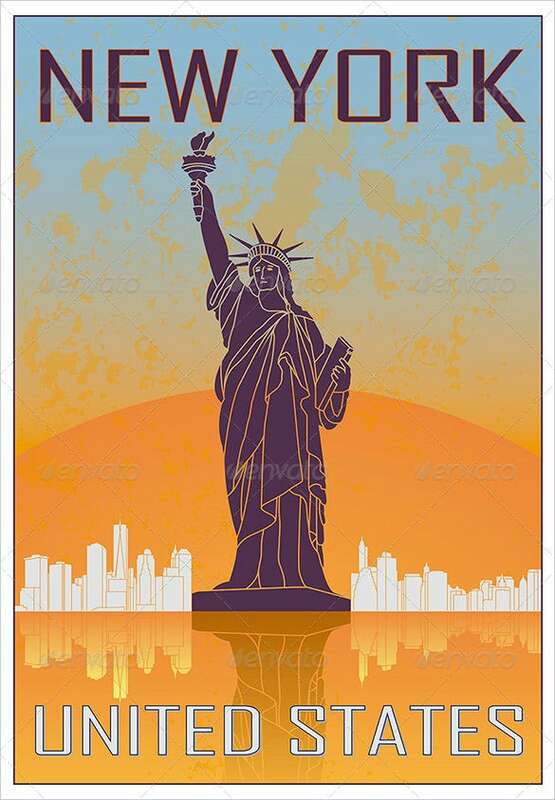 As the name suggests, New York vintage poster template depicts New York city skyline and the statue of liberty. The skyline is white and the background done in orange. The template is layered, Vector EPS and JPG image graphics files. 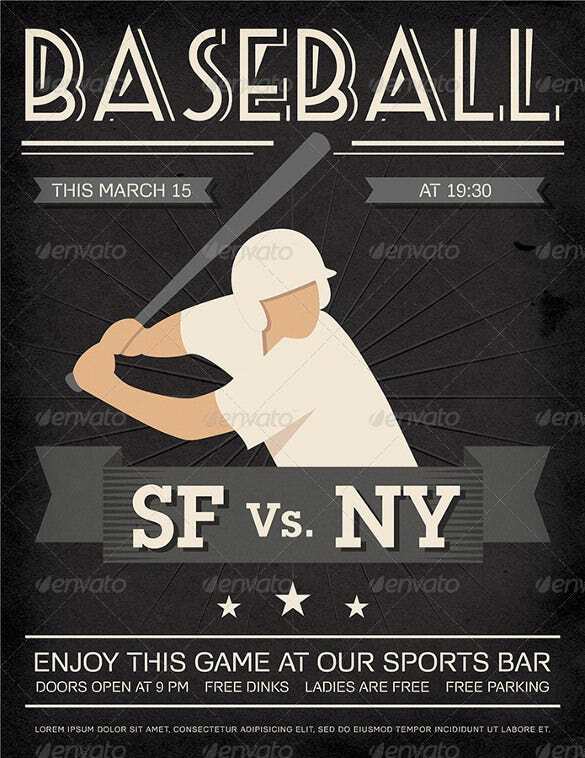 Vintage and detailed Baseball Poster PSD Format is ready to print vintage baseball poster format. It allows you to edit text layers, and have 3 PSD files of 3 colours of 8.5×11 size. It also comes with CMYK and 300dpi. 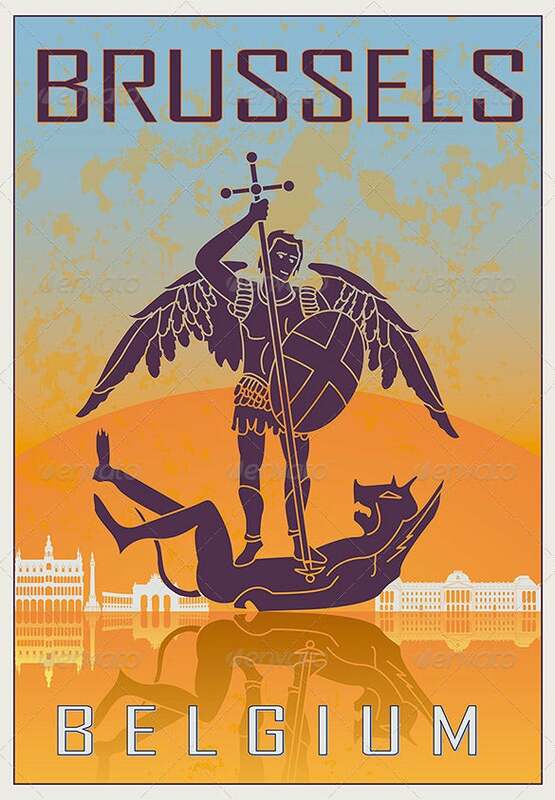 Brussels Vintage poster depicts Brussel, Belgium poster with background in white, orange, and blue background. It has Adobe Illustrator 10 illustrator vector and 8 EPS Vector which allows you to edit entirely. It also consists of high-resolution JPG file format. Printable Vintage sea ocean travel tropical island poster has editable Render in JPG format and EPS vector. The illustration is of flowers and birds. 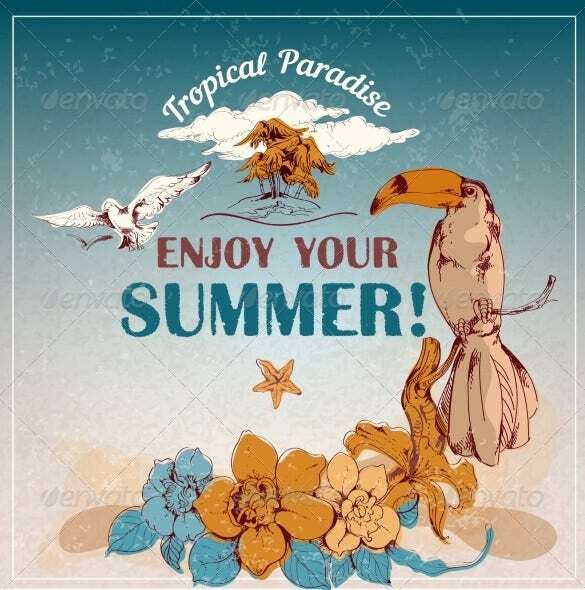 With this template, you can create banners, flyers to promote tropical travels, vacations, cruise and any such events etc. 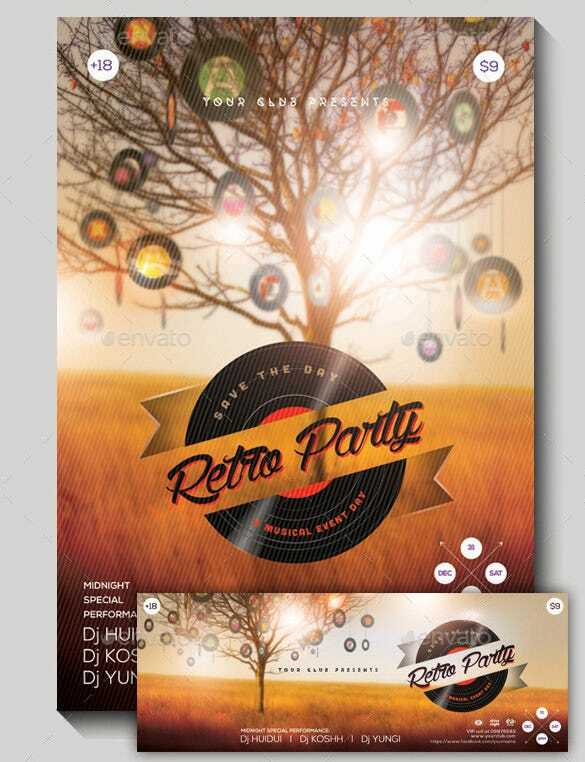 With Retro Party Vintage template, you can create retro party poster themes and flyers easily. It comes in layers and allows you to edit everything including pictures and colours. It also has CMYK 300dpi print ready. The print dimension is 11×16″ of 125″ bleeds. Ultimate Collection Vintage Poster Premium Printable consists of 10 matchless beautiful vintage posters. It comes in 2 bundles Vintage Poster Bundle 1 and Vintage Poster Bundle 2 and each bundle consists of 5 vintage posters. In both cases, 8.5×11.9 inch, 300dpi and print ready CMYK. 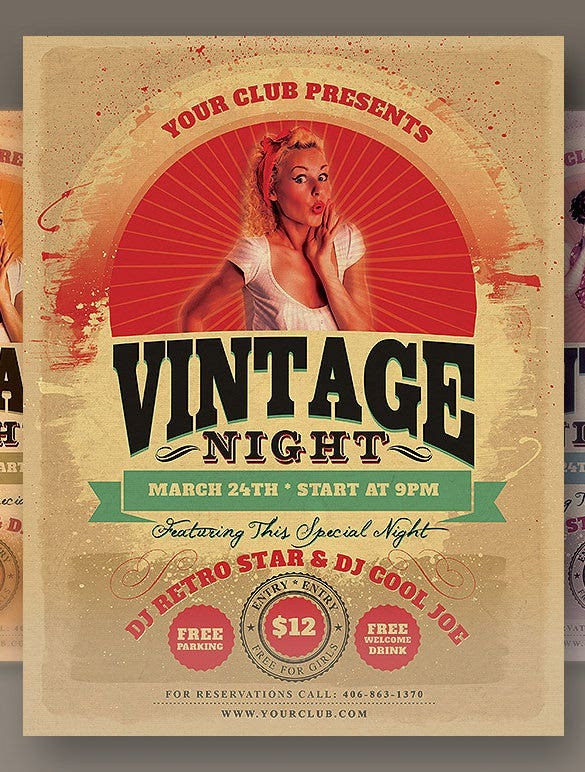 Vintage Night Party Poster PSD designed to promote and design invitation to any of your projects or parties. You can create retro style flyer, invitation, posters etc. You can download some of the designs free. Size is 8.5×11 and 300dpi resolution and CMYK. Circus Performance Announcement Vintage Poster meant for making and promoting circus show announcement vintage posters. 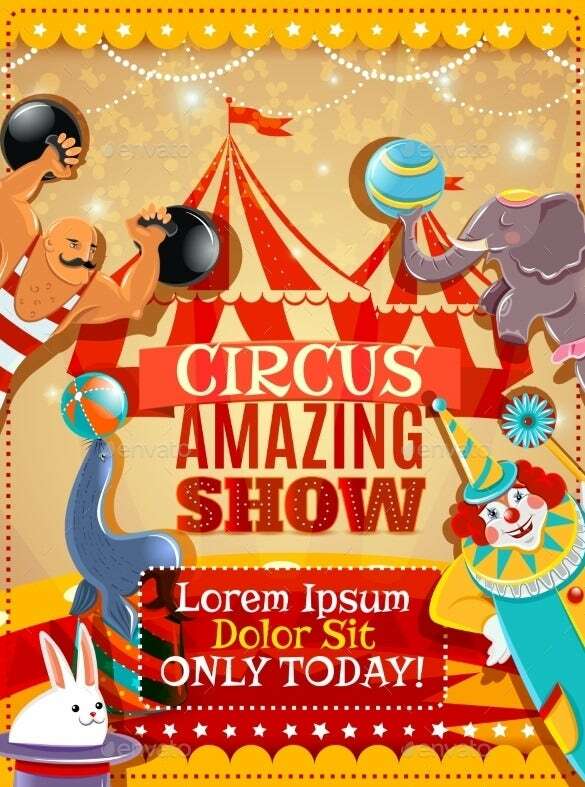 It includes illustration of strongman, clowns, and animals for the travelling circus group. It has editable Render in JPG format and EPS vector. It comes in layers and need minimum Adobe CS version. 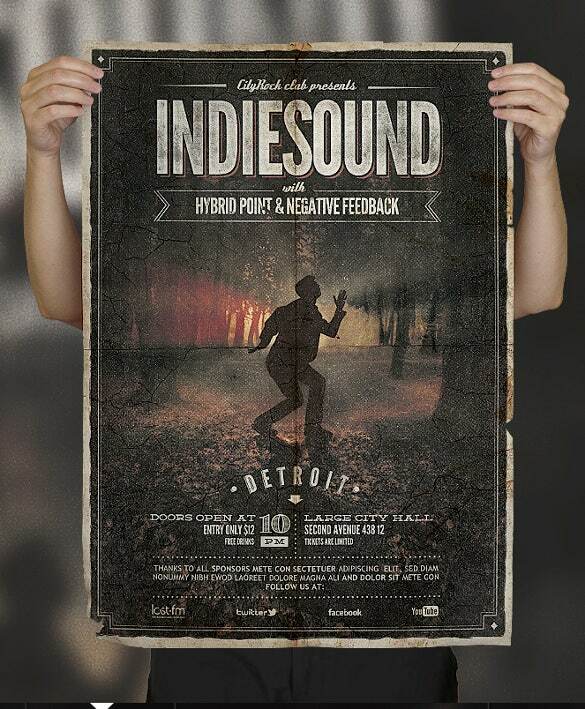 With Vintage Event Poster Format, you can create vintage posters to promote any forthcoming music events or concerts. This template best suites blues, acoustic, alternative, folk and rock gigs etc. It has InDesign CC-.indd, InDesign IMDL and Photoshop – .psd files. As the names suggests, this template is for Saint Patrick’s Day. 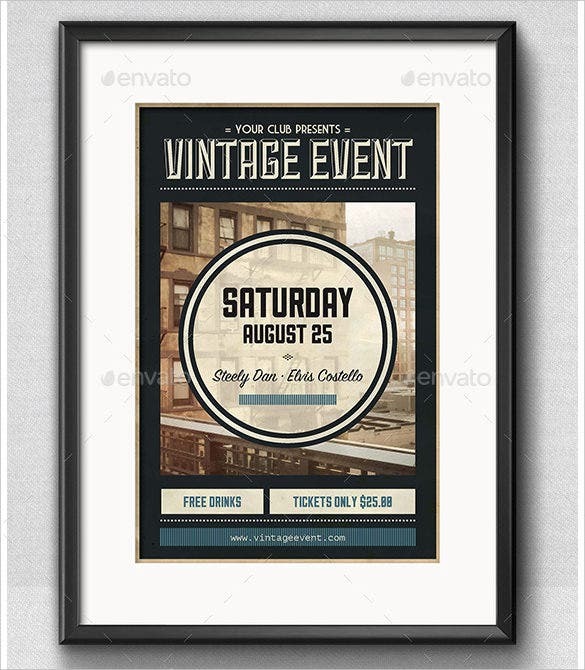 You can create vintage poster by adding two images – Image Holder and Flag Image Holder. The layer of the main image is red and the other one is in orange colour. The text and the images are editable. Vintage posters are quite historical as they are the chief source of advertisement or business promotion before the advent of digital templates and pampletes. Today can be easily edited and printed so that they can be utilized for the specific purpose. You can design inspirational and motivational posters using your imagination and creativity. 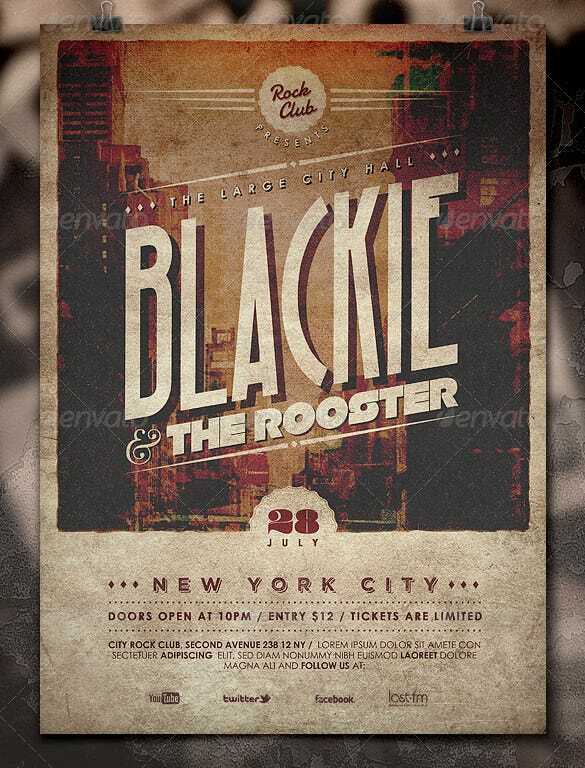 Vintage Poster Templates play very important role to reach out to the crowd for promoting any events without having to spend much on creating posters, flyers, banners, covers etc. They are so easy and user-friendly that they are print ready and you have the options to edit according to your requirements, which add more weight to your promotions.